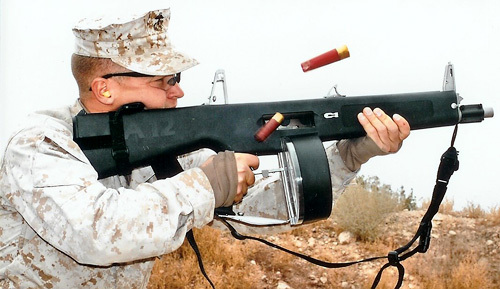 AA-12 Combat Shotgun Can Fire 5 12-Gauge Shells Per Second | OhGizmo! Anyone who’s watched Mythbusters enough knows the damage a shotgun can cause. But imagine combining that firepower with the ‘benefits’ of a machine gun. What you’d end up with is the Atchisson Assault Shotgun, or the AA-12 for short, which is capable of firing up to 5 12-gauge shotgun shells per second. The gun was originally designed by Maxwell Atchisson way back in 1972, but in 1987 he sold the rights to a company called Military Police Systems who spent 18 years improving and perfecting the original design. Not only can the AA-12 cause serious amounts of damage in a small amount of time, but thanks to a proprietary gas system there’s little to no recoil, which means the weapon can actually be fired with one hand if you’ve got the muscle. It’s also made from aerospace-grade stainless steel which means there’s minimal cleaning and it actually self-lubricates with the carbon produced by a shell firing. Future Weapons had a chance to try out the AA-12, and you’ll find a clip from that episode after the jump. The perfect companion for every zombie invasion. Seriously? Thats like a grenade that first blows you up then a second pod pops out of it and releases 1,000 deadly spiders and the spiders are all wearing ebola tainted sweatervests. Sure that would be cool but what army really needs that kind of overkill? No people only die when a PERSON uses a weapon against another person. Let's not blame the car for the death of a person when a drunk driver crashes into someone. Gee I want one.. where can I get one and do I have to get a different permit?? I have a C/C..